Almost six years ago, I stood on the lofty shoulders of the worlds tallest giant. That giant is Everest, which unlike your average run of the mill giant, offers no gentle lift to the top. As anyone who followed that expedition will recall, things for the most part went without a hitch. I had a micro-disaster on Pik Lenin, but then wiped clean my slate by climbing a couple of Himalayan peaks with relative grace and only a modicum of climbers anxiety. Everest followed suit and aside from the usual aches and scrapes, came back home in possession of all the fingers and toes I had left with 10 weeks after setting sail from Terminal 4. I then spent a good 5 years living with the Everest halo, generally being the only guy in the room to have ventured higher than the Aiguille du Midi, as is customary for most fellow summiters. Aside from carving a new career in a business far removed from expedition life, once 2012 came and left I had no further mountain plans, I was simply flat. It’s very difficult to rekindle a flame once the original spark has died, however as luck would have it, I have spent the past 6 years stumbling towards my next goal, often blissfully unaware of how everything would link together. It started in Chamonix where a break in the weather meant I could venture into the clouds with a local paragliding instructor on my first tandem flight. 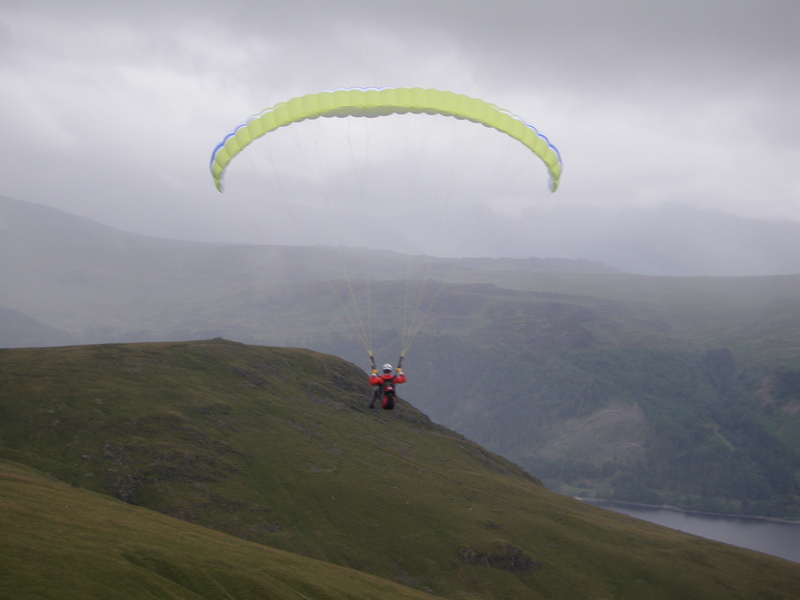 That experience added much fuel to an already burning desire and a couple of months later, I was booked onto a paragliding taster course, a one day course in Scotland designed to get the very basic manoeuvres learnt, mainly how to launch and land a paraglider. There wasn’t much time for anything else in that day, and despite starting the day in many tangles, I ended the day with my first solo flight of almost 5 seconds on an almost flat slope. Reading is the next stage, reading about wings, venues, hills, possibilities, and then, after performing a minor miracle with my bank, I purchased my first paraglider. For my first solo flight, I walked to a remote valley in Scotland, and climbed an even more remote hill. Standing at the top, the conditions were perfect, and I knew exactly what I had to do. Still, that didn’t stop the nerves as I launched off the edge and into the heather clad abyss. I survived that flight, and many more mountain hops and wind soaring sessions at the beach. I traded that 20 square metre wing for something a little more sporty at 16 metres, where I headed back to Chamonix and through a twist of fate, met Scott, my occasional climbing and flying partner, who’s original flying partner had launched unceremoniously into a tree requiring a helicopter rescue from the side of Chamonix’s Brevent. 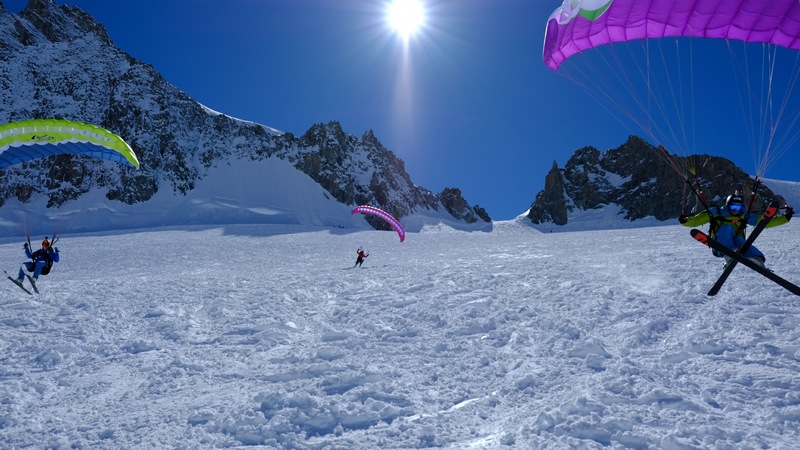 On that trip, I rapidly increased my flight count, along with making some relatively daring flights from the Aiguille du Midi north face and the Grands Montets. Coming back from that trip full of ideas, I traded my wing in for something even smaller, known as a speed wing, at 11 square metres. 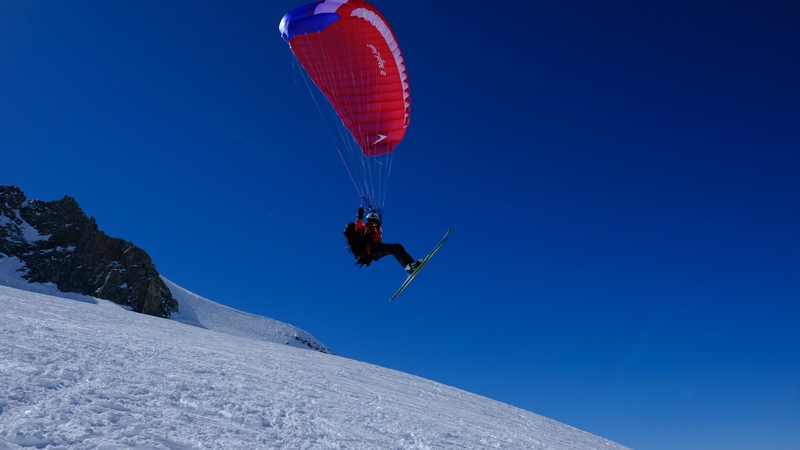 With Scott and ski guide Ewan, I embarked on a speed riding trip (skiing with a speed wing) to the French and Italian alps, and further pushed the conditions I was able to fly. The concept of RidingGiants hit me relatively late on in the process, despite it being simple. No one has ever taken a speed wing above 7,010m, a record which belongs to my friend Scott after his recent descent from the summit of Khan Tengri. Certainly no one has taken a speed wing into the death zone (above 8,000m), let alone with a pair of skis. 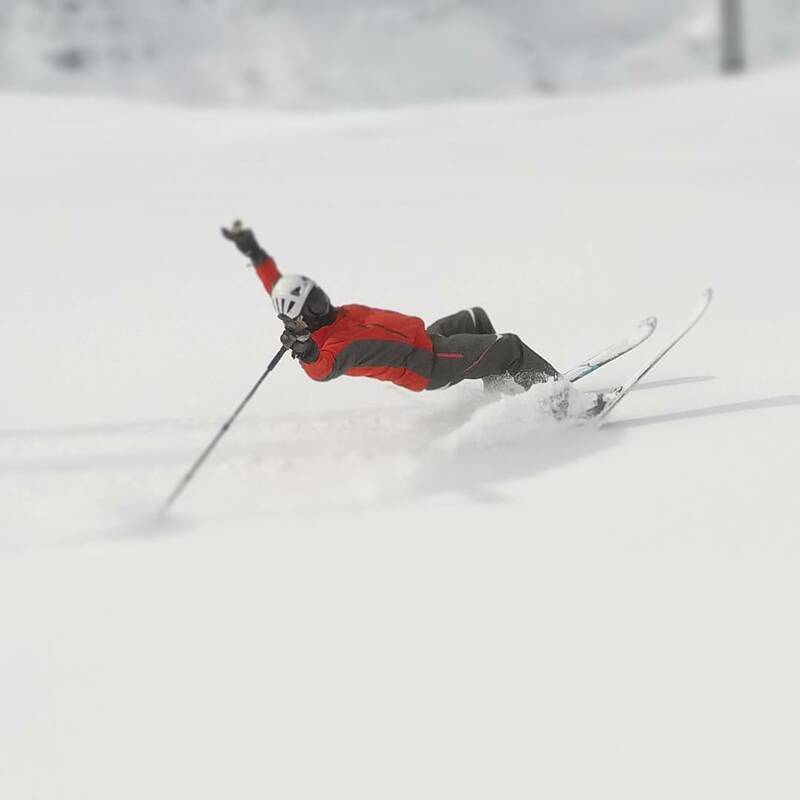 This is the dream of the RidingGiants team; to make the first ever speed riding descent of an 8,000m peak in autumn 2018. The peak in question is Cho Oyu, an 8,000m peak reached via Tibet. Cho Oyu is a perfect big mountain to ski, however some minor obstacles such as a bergschrund and an ice cliff half way down mean this peak is suited even more to speed riding, where the wing is used merely to clear obstacles which couldn’t ordinarily be bypassed by the majority of human skiers. RidingGiants will aim to be a journey of exploration, taking the small wings to the extremes faced on the world’s highest mountains; the Cho Oyu expedition will be that first step. So 700 odd words later, I’m proud to officially launch the #RidingGiants expedition for 2018, accessible here via the RidingGiants page. If you have any questions about this expedition, as always, please do reach out to me via the contact page on this site.